Double LP with full coloured inner sleeves. Yes! A full new FlyLO Album featuring Thom Yorke (Radiohead), Erykah Badu, Thundercat...Sure Shot! Flying Lotus - Putty Boy Strut (Until The Quiet Comes, new album out October 1st/2nd) from Warp Records on Vimeo. 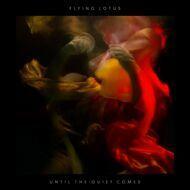 Flying Lotus - "Until The Quiet Comes" from WHAT MATTERS MOST on Vimeo.